This week's caption comes from GeekTyrant. 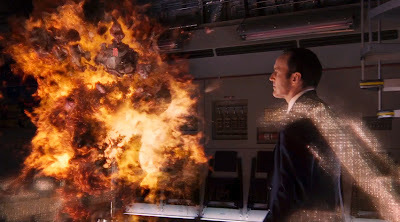 Since Agents of S.H.I.E.L.D. premiered this week, I thought it would make a good topic for a caption. (By the way: if you do a review on your blog send us the link for the Friday review round-up). Here's mine: "Agent Coulson made a note to put up larger 'No Smoking' signs." Have a better caption for this picture? Head down to the comments section below to throw it out there. The owner of the funniest and most original caption will be given praise and adulation here and on our Twitter and Facebook page. 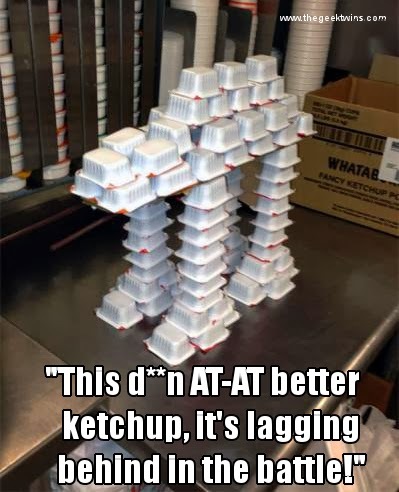 The captions two weeks ago for "AT-AT Made of Ketchup" were priceless. But there was another tie with two captions by Jeremy and Alex. So, the randomly selected winner is: Jeremy! If you don't feel like making up a caption you can still join in. Just use the voting buttons to vote up your favorite caption. Let's vote to see who can come up with the best caption! Click the little arrow next to the comment. Don't forget you can vote up your own comment. Every week I see funny comments with no votes. If everyone votes for their own comment then everyone starts with one vote. Vote yours up! What caption would you give this picture? Which is your favorite comment? "When he said fire in the hole...he meant it." Woo-Hoo... I am a winner. I going to tell everyone... thank you. This new Angry Birds game is really violent. "Dammit Johnson! How many times have I told you? Lighters and farts don't mix!" discussion. But I can see you’re already fired up. Oi! Who's f*cking about with the special effects again?